Each of these has pros and cons. 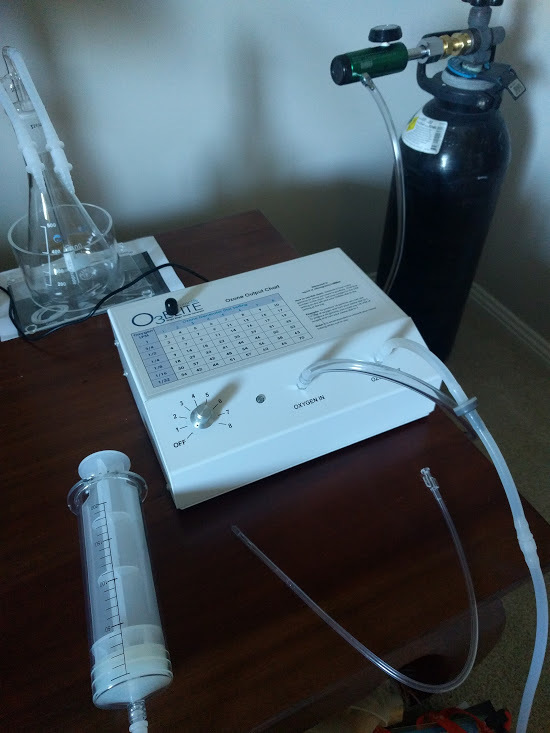 Bottled oxygen is cheaper in the short term than buying a concentrator (these can be several hundred or thousand dollars), but with bottles you have the hassle of refilling them occasionally whereas concentrators never run out. Bottled oxygen is also more pure, usually at 99.5% oxygen, whereas concentrators run around 93% maximum. In my opinion, if you plan on doing ozone saunas then the concentrator is the obvious choice, otherwise a bottle is better. Because of the prescription issue, I have chosen to use industrial oxygen cylinders. 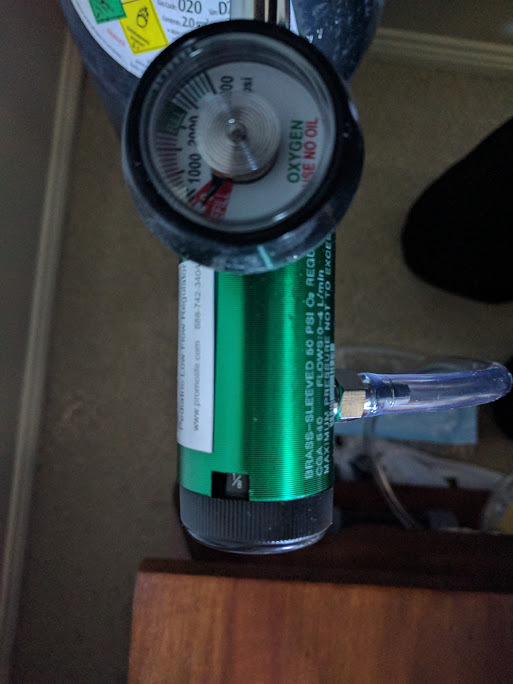 I have also learned that it is possible to get the medical cylinders without prescription, apparently it’s just the regulator that needs one, but I cannot personally verify this. Here’s what it looks like when it’s connected, you will need a spanner/wrench to tighten the nuts. Obtaining an oxygen cylinder is easy. In Australia you can open an account with BOC or Coregas and just go and pick one up (or delivery, but that cost more than the bottle itself for me). I got the D2 size for some portability, it’s got 2000 litres of oxygen in it. Before we start, it’s important to note the concept of gamma, which is a measure of the concentration of ozone that your generator produces. The gamma must be set to the right value for your particular treatment; in the case of RI I want to use a gamma of 40. Ok now we’re ready to start. Get ready by inserting a catheter about 5-10cm into your rectal cavity. The other end with the luer lock should be freely accessible. Now you need to prime the system, which means flooding it with oxygen for about 30 seconds before you start the generator; this is important as you need to remove any plain air from the tubes as this will cause poisonous nitrates to be generated if present. 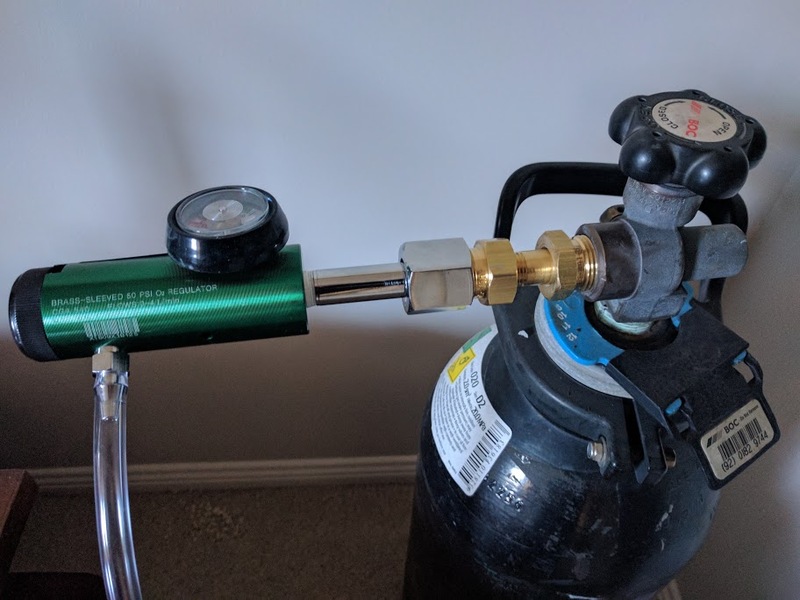 Make sure your regulator is set to 1/8 and turn on the oxygen flow by rotating the tap on the top of the cylinder. You’re unlikely to hear any hissing at this flow rate, so you might want to turn it up to 1LPM and pick up the end of the silicone tubing and listen for the hissing. Make sure you go back to 1/8 afterwards. 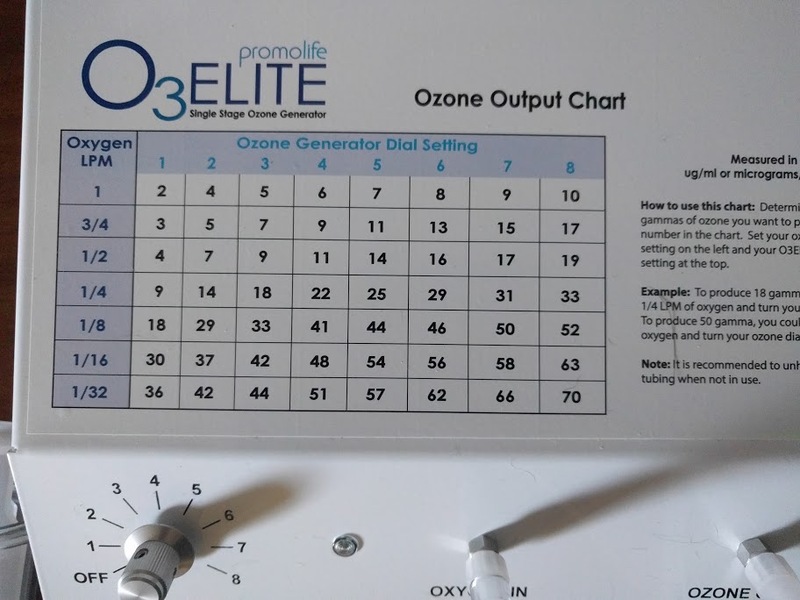 Now you can turn on the ozone generator by moving the dial to 4. Immediately insert the syringe into the luer lock on the end of the silicone tubing. After a few seconds you’ll start to see the syringe move as it fills with ozone. When it gets to just short of 200ml quickly turn off the generator and then the O2 cylinder tap. The residual pressure will keep filling the syringe for a few seconds so beware. Keeping the syringe upright (ozone is heavier than air), remove the silicone tubing and then connect it to the end of the catheter. You’re now ready to start introducing the ozone! Do this 50ml at a time, push the syringe and stop if it gets uncomfortable, but don’t worry it will pass. Once the full 200ml has been introduced, you can remove the catheter. Try to hold in the ozone for as long as you can. 30 minutes is the ideal you want to aim for, any less and it reduces the effectiveness of the ozone. You may even find that after 30 minutes, you don’t need to worry about releasing it anyway as it will have all absorbed. You’re probably not meant to re-use the catheters, but I am anyway as they’re expensive. I just clean the end out with warm water and it looks fine. Next time it’s used you could sterilise it with some alcohol rubs if you’re paranoid. That’s it for now. I’ll talk about ozonated water and neti pots next time! Great write-up, what are the settings when using a concentrator?